Tile has really come a long way in the design world. Where it used to be only for kitchen and bathroom floors, it's really evolved into a serious decorative element for multiple rooms in the house. Tile comes in a variety of materials but technology has enhanced it to give so many more effects now. We've discussed different types of tile in a previous post, but today we're giving the run-down on the visual effect tile can offer based on information from this article from Houzz. The benefit of tile that many people overlook when it comes to using it as a decorative element is the fact that it is so durable. Yes, it's semi-permanent as well but it can really create some impressive visual effects so look at the durability as a pro instead of viewing the semi-permanency as a con. Not too long ago, tile when from looking like stone plus to basic printed patterns and colors to also looking like wood (ie. wood-look tile floors that were all the rage). Now, tile is expanding into looking like other materials such as fabric, wallpaper, concrete, and even elaborating on the wood-look. To be honest, it just keeps getting better and better. Tile sizes are changing to. Tile used to only be available in certain square sizes which then evolved into larger square sizes, then there was elongated sizes like 12x24, oversized square like 36x36 and now there are all sorts of specific shapes tile is cut into such as fishtail, hexagon, fleur, leaf....really, the possibilities are endless. 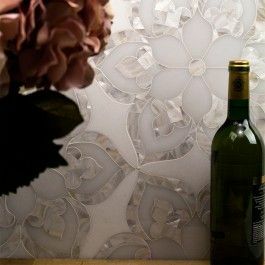 The nice thing about the larger sizes is that tile can create a seamless effect on a wall---with larger tiles and minimal grout lines, tile can be applied to walls and appear to just be an all over texture or finish. This consistency is very appealing since it is so durable. It's perfect for commercial and exterior applications to ensure longevity. The same is true for patterned tile. Because it is so durable and has the ability to show very little grout in a wall application, tile is quickly becoming a much more durable version of wallpaper. Be sure to use a skilled installer when installing this type of patterned wallpaper because it does require skill to make the pattern repeat consistent all over. There are certain linear patterns of tile now, as well, that, once applied give an overall fabric application effect. Once again, tile is much more durable than a fabric wall application so this a great development. Hospitality venues really get the most benefit from these type of tile applications because they can carry their themes throughout the building without risking them being destroyed when applied in high traffic areas. Of course, pattern and prints on tile have evolved dramatically as well and you can purchase tile now that look 3D and very realistically mimics patterns and objects that occur naturally in nature--such as marble, river rock, and even water. Wood has also continued to evolve with plenty of color and weathering level options that can be used almost anywhere. It's awesome to see something that used to be so basic being used in so many different applications. Really, when it comes to tile, with a good installer, the sky is the limit!